The first bell sounded, launching furious fighters into battle. “Round one. Fight!” Mission: to defeat the opponent, to climb through the brackets and win a new championship title in Chicago-area esports. 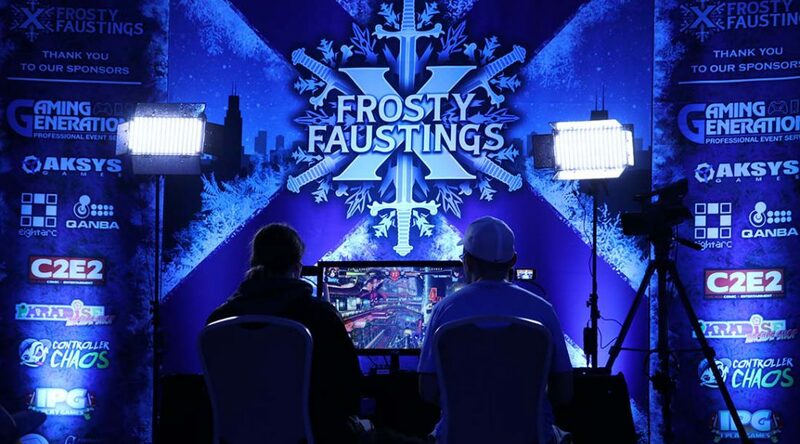 One of Chicago’s original esports events, Frosty Faustings, celebrated 10 years of fighting game history on Friday and Saturday. The 10th anniversary tournament hosted more than 1,000 spectators. Players competed for bragging rights and prizes. Cheers and boos filled the competition space as fans spurred on the top players. Attendees could perform in costume as their favorite characters in the inaugural cosplay, showcase artwork in Artist Alley, or purchase new gamer gear from sponsors, such as Gaming Generations, Windy Gaming and Paradise Arcade Shop. Players Warren “Doren2K” Pruitt (right on stage) and “Teresa” compete head-to-head on “Guilty Gear Xrd” in the 10th anniversary of Frosty Faustings (Jourdan Kerl/MEDILL). More than 1,000 players and spectators watch competitions at the Clarion Inn and Waterford Conference Center in Elmhurst (Jourdan Kerl/MEDILL). Games, such as “Under Night In-Birth,” pit individual players against one another in more than 30 tournament events (Jourdan Kerl/MEDILL). Gaming Generations, based in Wisconsin, provided gamers an opportunity to take home some of their favorite esports characters such as Pikachu, Goku and Super Mario (Jourdan Kerl/MEDILL). Judges prepare for the inaugural cosplay competition at Frosty Faustings with fans waiting to see the best (Jourdan Kerl/MEDILL). A cosplay performer displays his take on fictional character Hellboy, who was originally created by artist Mike Mignola. (Jourdan Kerl/MEDILL). The Artist Alley showcased custom creations from unique geek culture staples and fans could support their favorite artists with a purchase (Jourdan Kerl/MEDILL). Young participants also played Nintendo games at the booth of “I Play Games,” one of the 2018 partner organizations (Jourdan Kerl/MEDILL). At the Paradise Arcade Shop booth, attendees could customize a classic arcade fightstick with a selection of more than 100 joysticks, buttons and gamepad shells (Jourdan Kerl/MEDILL). Classic games such as “Darkstalkers 3” offered entertainment in free play areas (Jourdan Kerl/MEDILL). Collectors decals, to be placed on players’ gamepads, found high demand at the Windy Gaming booth (Jourdan Kerl/MEDILL). “BxA Squall” achieves a rare perfect knock out as Necalli against “Alphabee” in the first round of set two of the match (Jourdan Kerl/MEDILL).